We have been watching the weather for the past few days, looking for a good weather window in which to set sail for Providencia. One of the programs we use is called PredictWind, and on it one can see wind speed, swell size, precipitation etc over a four day period. It appears that as of now, Monday will be our best bet for departure. Here’s a suggested route for us to take, and it’s estimated that it will take us about 2 1/2 days. My sweet friend, ZoAnn, posted a Snickerdoodle bread recipe, which sounded so good, so I baked 4 loaves of it. Everyone loved it, and I had to quickly wrap up and hide two of them, which are now in the freezer for another time. The water maker project is drawing to a close. Danny is pure genius in how he designed and executed his plan for installing everything. I am always so amazed at his skills as I watch him work and try to help out. Just a few more of this and that, and it will be done. Today when he asked Aidan to climb in a narrow area in the hull, he was wiser and covered up his body to avoid fiberglass in his skin like yesterday. Jude embraced the project to add extra line to secure the trampoline. She did a beautiful job even though it was time consuming, and she had Jonathan as her trusty assistant. Aidan attempted to teach Skyler how to be a real pirate and climb the furled jib. She did pretty well. At one point this afternoon, Mycah walked into the salon where I was cooking, and said, ‘you now what I’m really craving Mama?’ Her response when I asked her what, was ‘a chocolate milkshake’. She then went back outside to be with the other creatures on deck. When Danny or the creatures tell me they are craving something, all I can think about is how to surprise them and fill their needs. I grabbed a can of Milo (a hot drink we drink in South Africa), evaporated milk, ice cream, ice and milk, and combined it all in the blender and created some fantastic chocolate malt tasting milk shakes. The creatures were so surprised and excited and drank them together out on the bow. After all the work was done, Skyler and Mycah went to the beach for a while, and the rest of the creatures went paddle boarding. One of the things we’ve been enjoying doing, is teaching Skyler how to talk Afrikaans.She has a long list of words and phrases that she’s memorizing, and is doing quite splendidly. We speak it in South Africa, and it sounds much like Dutch. I often talk to Danny and the creatures in Afrikaans and they do so well at understanding me and responding. This evening after dinner, Oom Steve came over with a couple of his friends to play guitar. We all sat out in the stern salon and sang along with the four guitars and fantastic voices. I love to listen to Danny and Mycah sing. 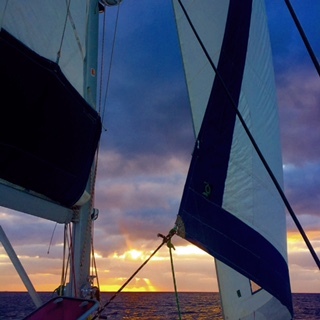 There’s something quite moving about all of us singing “Southern Cross” by Crosby Stills and Nash, while living on a sailboat. Tanda Malaika is a happy boat. Her family love her and have her organized and fit for the upcoming crossing.. We are grateful for our home, and look forward to many many years of sailing. Sounds like paradise!! You all look so happy, and I’m sure this is an experience Skyler will never forget. I just wish you and your happy boat were anchored near here in Santa Barbara…we MISS you all!! We miss you too Mom. You and Dad need to PLEASE come visit!!! !